6/15: We were happily surprised by a late titmouse nesting in a box near the house. I usually only get one titmouse nesting a year on my trail, and this was a second. Since they may be somewhat more sensitive to monitoring than bluebirds, I liked the idea of monitoring via nestcam. We waited until several eggs were laid, and then got our plan and gear together to quickly install the camera on 06/15/06. The box the titmouse chose is a plastic box (first time it has ever been used) with a coated wire grid on the bottom. She seems to spend a lot of time squirming, rearranging, and jamming stuff down through the grid, and the eggs are sitting on the bare grid. She didn't settle down to sleep until 9:10 p.m. I immediately realized I need to have the camera in my office so I can watch it constantly. An extension is on order. Now I will REALLY never get anything done! 6/16: She is still squirming around quite a bit. Took off for a while and came back with a beakful of grass, even though she's already incubating. Maybe she decided the walls aren't high enough. At night she sleeps with her head tucked under her wings. I have not seen a male feeding her. Supposedly during incubation, the male feeds the female both on and off the nest. 6/17: When she leaves the nest, she often returns with more grass or fur to build up the nest. Since the nest appeared to be hastily constructed (perhaps after a failed nesting attempt elsewhere?) she keeps messing with it. Lots of squirming around. Lengthy trips out (14 minutes one time.) On three occasions while I was watching, she brought back a large tuft of grass, some fur, and a crumpled up batch of leaves. On one return she made a weird vocalization (ack ack ack) but generally is silent. Looks around a lot and continues to squirm. Crest seems to be down all the town. POSSIBLY the male fed her once while I was viewing. 6/18: this is absolutely nerve wracking. She left the nest for TWO HOURS this morning (while box was in the sun, outside temperatures were 75-85 degrees F.) I was convinced she had been eaten or abandoned the nest. She returned with a large clump of hair, chattered for a second and immediately left again. She later added several more large "sheaves" or bundles of dark hair - human? about 3-4" long, to encircle the nest cup. I think this bird has Attention Deficit syndrome. She never sits still, constantly messing with the nest or looking around. The female in Bluebirds Inside the Nestbox sure didn't seem this squirmy. She added some pink fiberglass to the nest which I removed out of concern about irritation to the skin of nestlings. The nest volume has increased at least 1/3 since she started incubating. She does not cover the eggs with a "blanket" when she leaves the nest. It got up into the 90's today - I hardly saw her on the nest at all when I checked periodically. At 8:33 p.m., 80 degrees out, she still wasn't on it. 6/19: The female was not on the nest at night when we looked, and is not there this morning. I find myself thinking all sorts of irrational thoughts. Did we do something to scare her away? (Actually with the nestcam we are LESS intrusive as we don't need to physically approach the box). Did she get eaten by whatever she was gotten those long brown hairs from? Maybe another female will come by and take care of the eggs (never happens). Maybe I could incubate them (stupid illegal impractical idea). Maybe she knew they were cooked by the heat yesterday and gave up? I miss watching her activity. I did put a blade of grass over the eggs, and noted their position to see if there is any change while I'm away from the nestcam. 6/20: No more titmouse. Drat.... I left the set up in place. Interesting development this afternoon. Went from three eggs to two. Found a pecked egg (with contents - bloody indicating some development had started) on the ground about a foot in front of the entrance hole. Set up an inbox trap as there has been a male House Sparrow in the neighborhood that I have been unable to trap with the ground trap as I'm out of decoys. 6/21: Heard banging through the microphone around 11 a.m. Went downstairs to find I had trapped a titmouse! No idea whether it was the female that disappeared, or the male, or another bird altogether. It was MAD. It was pecking the box, and when I opened the door it hissed up a storm. I let it go and took the trap off. Now it will probably never come back. About a half an hour later, a House Sparrow hung on the hole looked in the box (probably the egg pecker) but did not go inside. Shortly thereafter, there was only 1 egg in the box (of course I stepped away from the TV when this happened. MUST HAVE VCR HOOKUP!). I went outside and found another pecked egg on the ground. 6/22: last lonely egg is still there. Only action is icky earwigs crawling around in the nest. While I was not looking, the third egg got pecked but was left inside the box. I put the hanging Van Ert trap on, but no trippers. 6/26: Last night a raccoon apparently got at the decoy eggs. The nest was messed up, and there were some racoon-looking hairs stuck to the wet exterior of this box, which is plastic. Two eggs were gone, and one egg was broken in the box - the raccoon probably couldn't get it out. This is what happens with boxes mounted on trees! Unfortunately titmice seem to like boxes on trees. See Predator/Problem ID Guide. A band of sheet metal around the trunk or a Noel Guard would help. 7/5: Since there has been no further activity in the box that originally had a nestcam, I'm switching to a House Wren (HOWR) nest under construction. Normally I do NOT let HOWR nest on my trail, as more HOWR nests = more HOWR = more predation and dummy nests in future years. However, it's late in the season, Tree Swallows have all fledged, and I rarely get a third brood of bluebirds. The HOWR attempted to use the Gilwood box a second brood of bluebirds just fledged from, but I wanted to put the nestcam on a box that had a removable roof, so I put another NABS box up 15 feet in front of the Gilwood, blocking the Gilwood, and installed the Nestcam. We cut out a little V-shaped notch in the side to thread the cable through. I moved the sticks that were in the Gilwood into the NABS box. 7/6: At 8:20 a.m., the female showed up and was spreading her wings over the messy sticks I threw in the box, trying to form a nest cup over the 1 egg she must have laid this morning while I was sleeping. The sound on the camera helps alert me to look at the video grab. The Video Capture is not working again, and I keep trying to call ADS Tech Support. Yesterday they had me reinstall it, and it worked, and now I'm getting the "failed to build a preview graph" error message again. Kind of annoying that there is no option to minimize the Ulead software - you have to keep opening and closing it. It helps to minimize other programs so you can always see the Video Grabber screen on the computer. The female was moving materials around and almost buried the first egg. She brought in a few items, and moved a spider cocoon. Surprisingly she is sleeping in the box, on top of the egg. 7/7: Lots of material (grass, sticks, feather) being added to the nest. I can't see the first egg, but there is a new one today. She usually moves the egg out of the way when she works on the nest cup. I think I saw her bring in a spider coccoon. She has been weaving and tucking grass into the nest cup. Saw HOWR (male?) checking out my GCFL box. 7/8: No eggs visible. Checked nest, one egg had fallen underneath it. What about the other egg from yesterday, and one from today? I saw a HOWR come out of the box when checking it. Checked again and found a second egg fallen underneath the nest, but it was broken. She is not sleeping in the box tonight. 7/9: Female in nest periodically, blinking, panting, and squirming around. Two eggs now. 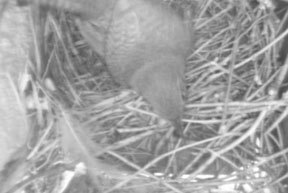 Tonight she appears to be sleeping on the upper edge of the nest (not in the nest cup). 7/14: Husband checked nest and accidentally broke an egg (big clumsy mitts.) The female immediately entered the box, ate the broken shell, and removed all bits of the nest cup that were "contaminated" with egg goo - feathers, grass etc. 7/19: nest appears to have been abandoned after egg breaking incident. Caught a house wren on video (female? male? another bird completely?) that came in, and quickly pecked one egg (leaving a big hole in the middle) and then stabbed the other eggs and removed them. I found another HOWR nest about 100 yards away - maybe they have moved? 7/20: One egg left (had rolled under nest cup). Nest appears to be abandoned. I removed it. 7/31: Probably the same HOWR moved to a Gilberston box. She laid one normal egg, and then two pure white eggs. I've never heard of this happening. 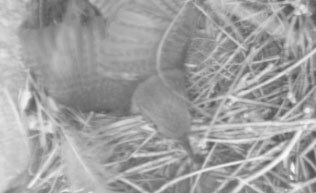 We set up the nestcam in the Gilberston, but it is very difficult to position the camera in that style box. We also moved the nestbox becuase the 200 feet of cable didn't quite reach, but the HOWR didn't seem to mind. 8/1: Incubation. Annoying not to be able to see the whole interior of the nest. The hole is so close to the roof that the bird actually knocks into the camera on entering. 8/5: It's been very hot. Today I captured a clip of the incubating female panting. She is in and out of the box a lot. 8/6: I noticed she sings or "talks" when she comes back to the box. I hear the male singing a lot in the background. 8/9: the female occasionally makes a drilling move on the the side of the box (I think - I can't see on the nestcam how she is making it) before she leaves the box. Incubating bluebirds do this sometimes on the floor of a nestbox. It has been theorized that this movement may knock parasites down to the bottom of the box. This box was eventually abandoned, eggs left behind. Not sure why. A House Sparrow was in the area shortly afterwards and either he or another critter got the eggs. DARN!